The scene of the fire at the farm. Flames leapt into the sky and smoke could be seen from miles around as the blaze broke out at Rhynagarrie Farm. 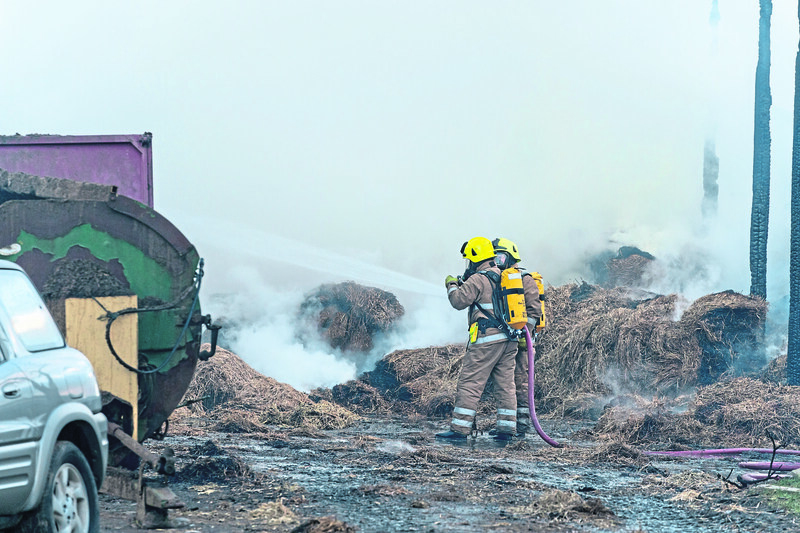 Firefighters from Aberlour, Rothes, Dufftown, Elgin and Keith were all sent after reports a large building filled with straw bales and machinery was engulfed in flame. There were also serious fears that livestock, including the farm’s prized herd of cows, could be threatened. The business is owned by W R Fraser and Son and in their hour of need they saw workers from neighbouring farms rush to their aid. They joined with firefighters to not only extinguish the flames but also protect Rhynagarrie’s livestock from harm. Despite their best efforts, a large steading was completely destroyed and the much-needed hay inside badly damaged. It’s thought farm machinery may also have been destroyed. But crews successfully prevented the fire from spreading to other outbuildings on the farm. Brian Duncan, a farm worker at neighbouring Wester Elchies Farm, was among those who leapt into action after seeing plumes of smoke billowing into the sky above Moray. He said: “I could see and smell the fire before I every got here. “I came to see what I could do to help – so did the rest of the boys. It was great to see everyone come together to help out. 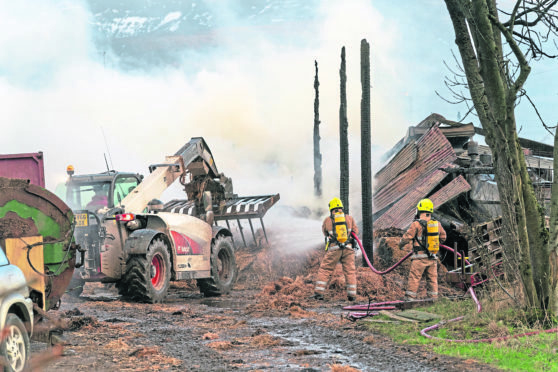 As firefighters extinguished and dampened down the smoldering hay, another helper from a neighbouring farm, Graeme Shand, carried it away by tractor and deposited it into a nearby field where it was patted down. Cattle housed in an adjacent steading were moved as quickly as possible so they avoided any injury from smoke inhalation. A spokesman for the fire service confirmed that no one had been injured in the incident. He said: “We turned out at 1.45pm to a farm fire which involved a large farm steading containing bales of hay and also some farm machinery.